Tony “Tempt One” Quan was struck with the disease at the age of 34. At the time he was one of the leading graffiti artists and social activists in Los Angeles, excelling at a design approach that combined a Latino (or Cholo) style with New York graffiti influences. The artists in Los Angeles are diverse, and often at odds. The film starts out deep in the underground culture and cliques that make up this marginalized world. But when Tempt One is struck down and becomes bedridden, the story expands. 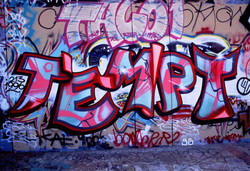 Mick Ebeling, a socially conscious designer, animator, and innovator hears about Tempt One’s plight. Ebeling’s respect for the the artist’s vision and talent combined with the dedication of a community of artists committed to keeping Tempt One active. Thus begins a journey into the power of some mind-blowing technological developments. 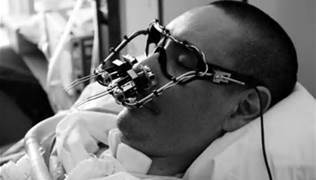 With a free thinking group of designers and artists, some input from Dell Computer, and the help of Open Source software, Ebeling creates the EyeWriter, which allows a paralyzed patient to draw and communicate using only the eyes.